Delight and I are two American Christians who are very concerned about human rights offenses in Europe and, in particular, in Norway. This unique event is only 10 days away. Much of the information is in this article that Delight shared. As we get closer to September 23rd, I will keep you updated on scheduling. The fight against the Norwegian CPS continues. 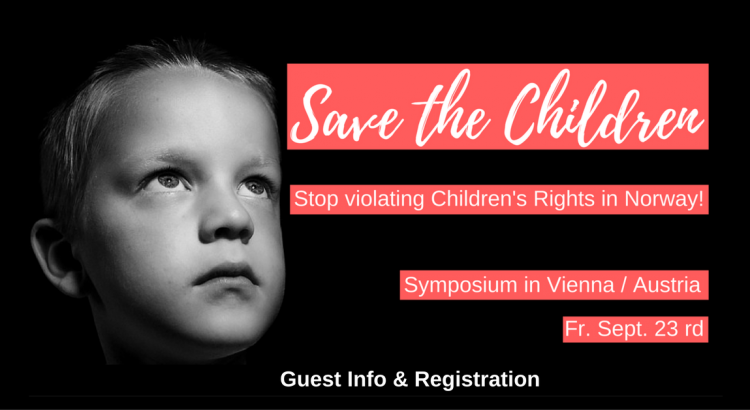 On Friday, Sept 23rd 2016 a symposium is being organized in Vienna to explore the human rights violations happening in Norway with respect to child protective services. Barnevernet victims, lawyers, and CPS experts have confirmed their attendance. This event will grow in the future into another world-wide protest. The fight is not over until Barnevernet is significantly reformed. Save the Children‘ is an initiative of individual Christians in Vienna/Austria from different Churches and Christian organisations. We are deeply concerned about the violations of Human Rights and Children’s Rights in Norway. Since we’re familiar with several cases where Children were removed from their families for no good reasons, we now want to address these issues publicly. This entry was posted on Tuesday, September 13th, 2016 at 6:40 AM and is filed under BIG GOVERNMENT, Commentary, Education, IMPORTANT UPCOMING MEETINGS, News. You can follow any responses to this entry through the RSS 2.0 feed. You can leave a response, or trackback from your own site. I am glad too, Pastor Jim. It will be live-streamed but as there is a 7 hour time difference most Americans will be in bed at the time of the major event. I am going to try and watch it in real time but many may not be able to.